At Midseason, Serial Dramas Serve Up Big Twists TV critic David Bianculli talks up some of the twists and turns presented recently in some of his favorite shows — including Dexter, Homeland and The Walking Dead. Note: Spoiler-rich. By now, I hope my position on spoiler alerts is firmly established. My feeling is that once something has been televised, it's fair game for discussion. I feel it's the responsibility of the person who's delaying his or her enjoyment of a TV show to avoid mentions of it, rather than putting the onus on critics. And believe me, I know that's not always easy. I have to do some time-shifting myself — there are so many good shows presented on Sundays this season that it sometimes takes me the whole week to catch up on the episodes I've recorded. 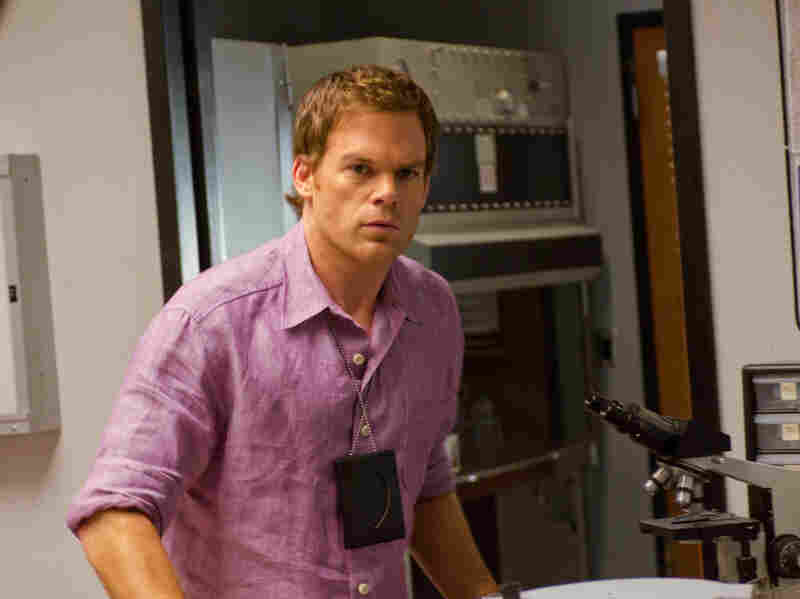 Showtime's Dexter, starring Michael C. Hall, just served up the biggest twist of the season to date. So here's the deal. Many of TV's best shows have just presented significant pivot-point episodes that are well worth discussing. These are shows I've reviewed and raved about before. I'm talking about such shows as Dexter, The Walking Dead and American Horror Story — and if you're up to date on those programs, you know why they deserve the spotlight. If you're behind, now's the time to stop reading. I don't want to spoil the enjoyment of viewers who come late to the party — but I don't want them to spoil my party, either. Showtime's Dexter just served up the biggest twist of the season to date. All season, we've been following two serial killers working as a team — Professor Geller, a religious zealot played by Edward James Olmos, and his young protege Travis, played by Colin Hanks. In recent episodes, Travis has broken away from Geller and teamed with Dexter to try to catch him. At the end of last week's episode, Dexter found Geller's hideout in an abandoned church, and discovered a trap door that led to a basement and an old freezer. Dexter, played by Michael C. Hall, opened the freezer lid and found a surprise: Geller. Which means Geller has been dead all along — and yes, that means Travis did kill all of those people. AMC's The Walking Dead, cable TV's highest-rated scripted series, presented its midseason finale with a game-changer, too. We've known, for a few weeks now, that Hershel, the owner of the farm on which our heroes have taken refuge, has kept a pack of zombies imprisoned in his barn. He thinks of them as loved ones with a disease; Rick and the others, especially Shane, think of them as monstrous "walkers," deserving only of a swift death. So in the midseason finale, Shane finally rebelled by unlocking the door to the barn so the zombies would attack, leaving no choice but to kill them. It was an emotional bloodbath of a climax — made even more so when it was discovered that the last walker to exit the barn was young Sophia, the girl for whom our heroes had been searching for weeks. Hershel's people had found her, as a zombie, and locked her in the barn, without telling Rick and the others that they were searching in vain. So what's next? I don't know, but I can't wait to find out. A few other series, at this point, have served up strong twists as well. Showtime's Homeland has identified the POW who was turned by al-Qaida — it was Tom Walker, not Carrie's prime suspect, Nick Brody. But it looks like Brody may still be in play regardless, as a sort of Manchurian candidate rushed into public office. And on FX's American Horror Story, it was revealed that pregnant Vivien's twins were sired by different fathers: one by a dead evil spirit who raped her, the other by her husband Ben, played by Dylan McDermott. When Ben learns of the dual paternity, he suspects her of cheating on him and visits her in the hospital, where she's been medicated and placed in restraints because she claims she's been attacked by ghosts. Vivien, played by Connie Britton, doesn't speak, but what her husband says to her is as scary as any spirit: that he's not going to do anything to help her get released from the hospital. Other shows have amped up the action, and the emotional stakes, too. The Good Wife, on CBS, is starting to pull Will and Alicia apart just after getting them together. This season seems, so far, to be rather aimless, but there's still time for it to find its focus and momentum. HBO's Boardwalk Empire is finding its momentum for the first time, after almost two full seasons. As for the others I watch regularly, Fox's House and Glee seem to be having off years. Fringe is as inscrutable and interesting as ever. Desperate Housewives — and I may be the only person still watching that show, as it lumbers to the finish line like an undead walker — is doing good, dramatic stuff with Felicity Huffman as Lynette, but not much else. And ABC's freshman series Once Upon a Time is so far, so good, giving us one piece of the puzzle at a time in a way that's satisfying yet leaves us hungry for more. And that's the way it should be — but once upon a time, TV didn't present so many of these good series at once. I'm not complaining, mind you. Just exhausted. David Bianculli is founder and editor of TVWorthWatching.com. He teaches TV and film history at Rowan University in New Jersey.